During the eight years since she moved here to teach printmaking and drawing at the Cleveland Institute of Art, Holly Morrison has come to play an increasingly important role in representing the vitality of Northeast Ohio’s cultural life. 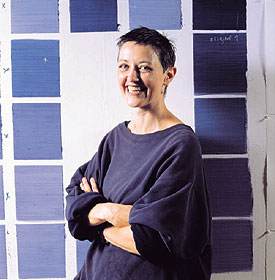 In her impressive public installations, as well as in her more private collages and drawings, Morrison, born in Nebraska, and trained at the Kansas City Art Institute, as well as Cranbrook Academy, has provided Clevelanders a range of both powerful and subtle visual experiences creatively combining metaphor and symbol with detail and fact. 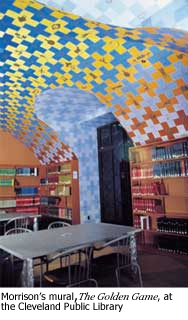 Users of the new Stokes wing of the Cleveland Public Library often have their initial encounter with Morrison’s work when they visit the Northwest Tower, where her site-specific mural, The Golden Game, floats, rebus-like, from the ceiling onto the walls, shading from blue to purple through reds and yellows, shimmering with gold and silver flake. Offering her own (very postmodern) interpretation of medieval alchemical texts in the library’s special collections, with an array of mystical emblems organized in a cruciform chessboard pattern, Morrison has provided readers with surroundings highly conducive to a stimulating research experience. During the successful run of Urban Evidence: Contemporary Artists Reveal Cleveland, a three-venue exhibition held in the fall of 1996, Holly Morrison had the opportunity to energize yet another wall. This time, she detailed configurations of a certain sector of the city into a thought-provoking grid displayed at the Cleveland Center for Contemporary Art. Widely praised in reviews of this important Cleveland bicentennial show, Morrison’s Now—Then comprised a careful juxtaposition of black and white photographs focusing on the unseen details of the urban environment. After observing her surroundings over the course of a calendar year, she carefully selected 128 views, then arranged them provocatively, in rows four high and 30 across. Asking viewers to focus more intensely on the mundane and the familiar, Morrison actively encouraged Clevelanders to rethink our accepted urban identity. Simultaneously, by hanging poetic views of Lake Erie on an opposite wall, she invited us to consider our locale from the more obvious (yet also often overlooked) angle of the natural horizon. As her work has matured, we have had the opportunity to see Morrison’s distinct creative patterns develop. Frequently centering on the resolution of opposites, she has striven to dissipate arbitrary distinctions: between differing media, between realism and abstraction, harmony and dissonance, external and internal, embodiment and intangibility. Like the alchemists she admires, Holly Morrison effects physical transformations which seem to radiate an aura of the spiritual.